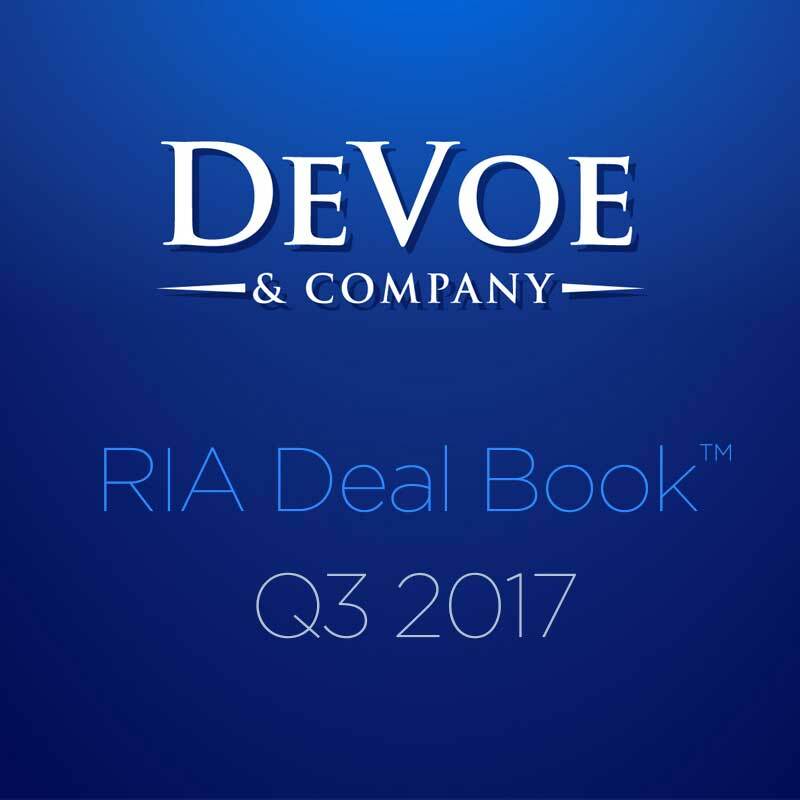 RIA M&A Deal Books™ — DeVoe & Co.
Understanding the RIA M&A landscape is critical to any advisor contemplating a potential sale, merger, or acquisition. That’s why David DeVoe has been tracking M&A activity in our space for over 16 years. And why our partner, Nuveen Investments, collaborates with us on the topic. The Nuveen / DeVoe RIA Deal Book™ is delivered quarterly to provide you with the most accurate read on what is happening, why it’s happening, and what is most likely to happen next. So you can make better decisions. With an epic final quarter, 2018 became the RIA industry’s fifth successive record year of merger and acquisition activity. In the midst of a volatile, then sharply declining stock market, the blockbuster fourth quarter yielded double the transactions of the same period a year ago. Q3 2018 saw a return to averages for RIA merger and acquisition activity. After the ups and downs of the last few quarters, most metrics returned to their historic norms, yielding a strong YTD and the expectations that 2018 will be slightly above 2017. RIA merger and acquisition activity dropped dramatically in Q2 2018, creating a whipsaw of extremes over the last several quarters. A total of 32 transactions were executed during the period, a steep drop from the record 49 transactions in the previous quarter. RIA Merger and Acquisition activity was off to a record start in the first quarter of 2018. Rebounding from a weak second half of 2017, the deal volume hit 47 transactions, making it the strongest quarter on record. The RIA industry experienced its fourth successive record year of merger and acquisition activity in 2017. A record of 153 transactions was tracked during the year, a 6% increase over last year’s high-water mark of 145. RIA merger and acquisition activity encountered a precipitous drop in the third quarter of 2017. Posting just 29 transactions, the period was the weakest quarter the industry has experienced in nearly three years. RIA merger and acquisition activity started strong in the first half of 2017 and is on track to potentially achieve a third successive record year, according to research conducted by DeVoe & Company. The first six months yielded 82 transactions, a 15% increase over the 71 deals in the same period a year ago. RIA merger and acquisition activity got off to a record start this year with 44 transactions executed in the first quarter. The transaction volume was a steep 29% increase over the 34 deals tracked during the same period in 2016, according to research conducted by DeVoe & Company. Merger and acquisition activity in the RIA industry hit a new all-time high of 142 transactions executed in a single year, according to research performed by DeVoe & Company. This third successive record year of M&A is an 8% increase above the previous record of 132 transactions. The fourth quarter was the ninth successive quarter of 30 or more transactions, demonstrating a sustained and consistent robust M&A market. 2016 is on track to be an all-time record year for RIA M&A activity. A total of 109 transactions were tracked through the first three quarters of this year versus 100 deals executed during the same period in 2015, according to research performed by DeVoe & Company. 2015 is the high-water mark for RIA acquisition activity in a single year, with a total of 132 deals executed during the 12-month period. It seems likely that 2016 will exceed this number. After a record-breaking 2015, RIA mergers and acquisitions maintained their swift pace through the first half of 2016. The industry saw 71 transactions during the two-quarter period, essentially on pace with the 70 transactions completed during the same period last year, according to research executed by DeVoe & Company. 2016 started off the year with solid RIA mergers and acquisitions momentum. The industry experienced 33 transactions during the period, according to research executed by DeVoe & Company. Although this transaction volume is below 2015’s record of 37 Q1 transactions, it is well above the 10 and 12 Q1 transactions closed in 2014 and 2013, respectively. Overall, the quarter indicated continued strength in M&A activity in the RIA industry. In 2015, mergers and acquisitions activity in the RIA industry hit an all-time record of 123 transactions executed in a single year. This new high water mark is a 37% increase above 2014’s previous record of 90 transactions, and more than double the 58 transactions executed in 2013. A total of 25 RIA Mergers and Acquisitions were executed during the third quarter of 2015, down slightly from the 27 transactions executed in Q3 2014. Despite this deceleration from five successive record quarters of activity, the year-to-date numbers are still at record levels. The 86 transactions tracked by DeVoe & Company during the first three quarters of this year are a 43% increase above the 60 transactions executed during the same period in 2014. RIA Merger and Acquisition activity remained strong during the second quarter of 2015, continuing the momentum of the previous six quarters. A total of 61 acquisitions were tracked by DeVoe & Company during the first half of this year, an 84% increase above the 33 transactions during the same period in 2014. An all-time record number of RIA transactions occurred during the first quarter of 2015, according to research executed by DeVoe & Company. This spike in activity follows a record year of RIA M&A in 2014. Over $90 billion in AUM was acquired through 34 transactions in the first quarter of 2015. The AUM transacted during the quarter was 14 times the amount acquired during the same period in 2014 and 43% higher than the entire year of 2014. A number of very large acquisitions drove the AUM figure to an all-time record quarter for the industry.